Last night, on a complete whim, I decided to run the Putnam County Classic, 8 mile race. I wanted to go for a run, and I figured, I hadn’t raced in awhile, so why not. It was sort of close by, a local race (the best kind of races) and long, but not I needed 12 weeks to train for it, long. I haven’t raced since April when I did the Hook Half Marathon. Since then, I’ve been maintaining a base and trying to just keep running at least 3 times a week in between the two times a week of CrossFit classes. The last time I ran more than 6 miles was back in May, and even then it was just a hair shy of 7 miles. So, 8 miles…totally do-able, albeit, a touch long and it won’t be easy. I did day of registration, which costs $25. I was also able to snag a t-shirt to add to my shirts to run in collection. I got there at about 7:30 for an 8AM race. A bit rushed, I was still able to register, visit the bathroom and quickly trek back to my car to throw on my socks and sneakers. 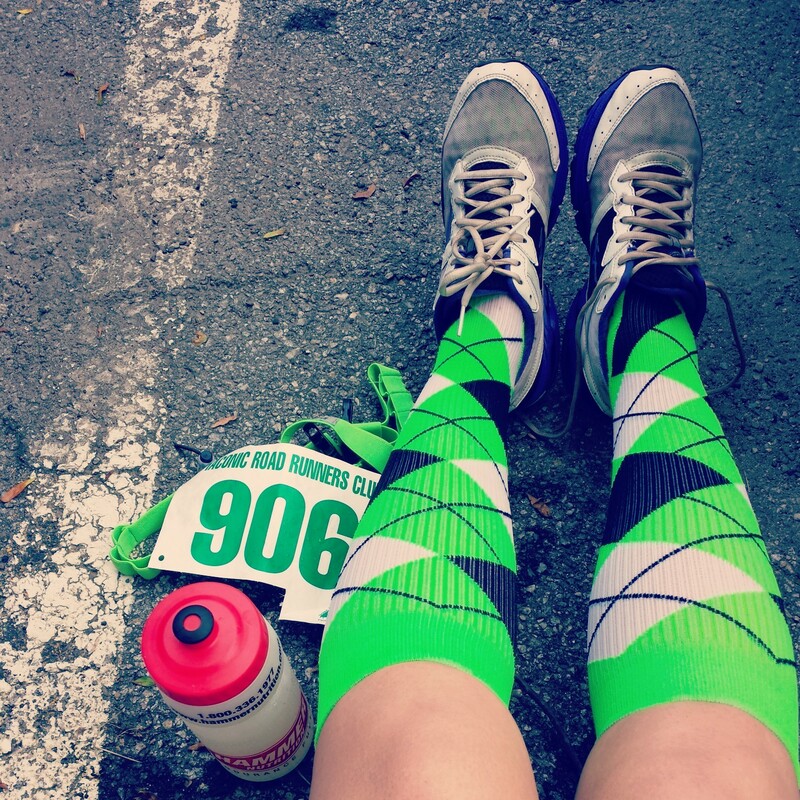 Putting on compression socks is a workout in itself and takes time. The race starts on the main road outside of the high school. The course itself was very nice. A couple of tough longer uphill stretches to contend with, but generally rolling hills throughout. The best part was running around Lake Mahopac. I never knew that lake was so big, and so beautiful! I wouldn’t mind one of those houses that dot the lake front. By the start of the race, it was almost 80 degrees at 84% humidity. I also had CrossFit the past two days which had a lot of leg work. My legs were pretty shot, it was hot and it was humid. This was going to be in trouble. The first half of the race was done mostly in the sun. I really struggled, and by mile three, nausea hit and I was walking. I wasn’t happy about it. I haven’t walked in a race shorter than a half marathon in a very long time. I still had 5 miles to go, the back of the pack (which included a woman pushing a stroller) was passing me, and I was getting increasingly frustrated at how I felt and why i couldn’t man up and push through. Was this me getting older? Was I losing my edge? My toughness? During times when your brain starts running faster than your legs…just stop and remember…you have to run your own race. At about mile 6 I felt much better (helped that the last half of the race was shaded) and started picking up the pace. I finished in a sprint, attempting to pass just one more person around the track, while staying ahead of the footsteps I was hearing closing in behind me. As we filed through the chute single file, I turned around to see who belonged to those footsteps and to tell him I heard him coming. He was an older gentleman and he smiled and gave me a encouraging pat on the back. Post race, I headed straight for the fire truck to literally get hosed down in the cold refreshing water. And let me tell you, there is nothing that tastes more awesome than cold watermelon post run. Everyone has a crappy race every now and then, but in the end, as long as you can look back and say you still had fun, then it was a success. I’ll be back for this one for sure. This entry was posted in Running and tagged 8 Mile race, Compression socks, Heat, Humidity, Putnam County Classic, Running. Bookmark the permalink. I have been getting dizzy and sick while I run lately, it’s effecting my times. I often feel frustrated because my pace should be improving, but I’m sliding backwards.. And fast! I know it’s due to low blood pressure and some other factors. However I have been trying to look at it on the bright side, at least! I’m still out there doing what I can!